"Take your pick," said the Wabbit. "There's only one box," replied Captain Jenny. The Wabbit leaned out of the jeep. "Makes life easier," he chortled. He gunned the throttle and spun his wheels. The box quivered like jello and jumped up and down. Lapinette pointed at the box. "The Wabbit says it's completely safe." The box suddenly rattled like a crate of beer. The sentries stiffened. "Inside," said the Wabbit, are all the bits we need to build a Stealthicator." Lapinette interrupted cheerfully. "The Wabbit says he found all the components in a dumpster outside the Space Agency." Jenny eyed the box cautiously. "What exactly does the Stealthicator do?" The Wabbit grinned ear to ear. "It paints the background of any object onto its front! Psst, the object vanishes." "The Wabbit says it's foolproof," said Lapinette. Jenny pursed her lips and swayed in a pirate fashion. "What if the onlooker runs round the object?" The background changes the sides to satisfy the viewer," laughed the Wabbit. Lapinette was delighted. 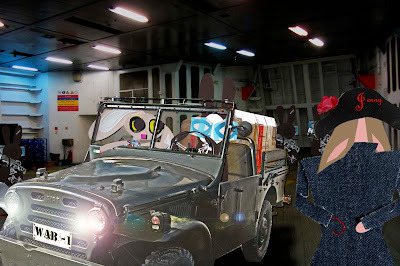 "The Wabbit says the Stealthicator can also paint the under onto the top." Jenny nodded. "That's all very well," she said, "but what if the viewer bumps into the object?" "The object is still there, I can't do everything," said the Wabbit.